Spanish immersion for all! - Why WVSD? What makes our program different and more successful than others? WVSD Personalized program is designed to be adapted to the school needs by forming our program to fit the school's teaching method and way of learning. We respect the children's learning process by adapting our program because we want them to feel comfortable and perform to their best! This way the children get engaged and more interested in learning a second language. 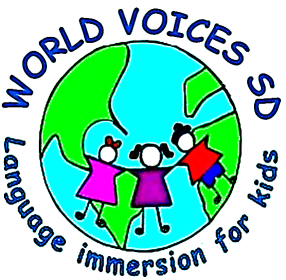 Why World Voices San Diego? Every child can and should learn a second language. We believe that learning a second language and being bilingual should be a norm, and not an exception among our children. WVSD works to teach Spanish to as many kids as possible. Most experts agree that the earlier a child is introduce and exposed to a second language, the greater the chances are that the child will become truly proficient in the language. A 02/1996 Newsweek article made the claim that "A child taught a second language after the age of 12 or so is unlikely ever to speak like a native speaker." This has been proven through many extensive research studies. Are more receptive to language learning between birth and the age of twelve. The earlier the language is introduce, the easier a good level of understanding and fluency is achieved. Bilingual people are more likely to succeed in other areas like grammar, writing and reading. On average students score higher on ACT and SAT test. Copyright © 2011 World Voices. All rights reserved.